Tonight we went to the Battle Axes in Elstree for a family celebration. The Battle Axes is a Chef and Brewer pub set in the Elstree countryside near Aldenham Country Park and Elstree Aerodrome. The setting is lovely, with a great pub garden for the summer and log fires in the winter. The interior is well decorated and welcoming, and we were given our own area to eat in as there were ten of us dining. The children were provided with colouring pencils and a high chair, but the children’s menu was quite expensive for the size of portion they were given. So thinking about this restaurant specifically for vegetarians, how did the vegetarian food rate? There were three vegetarian starters out of nine – Stilton and Mushrooms, Vegetarian Minestrone Soup and Summer Bruschetta. 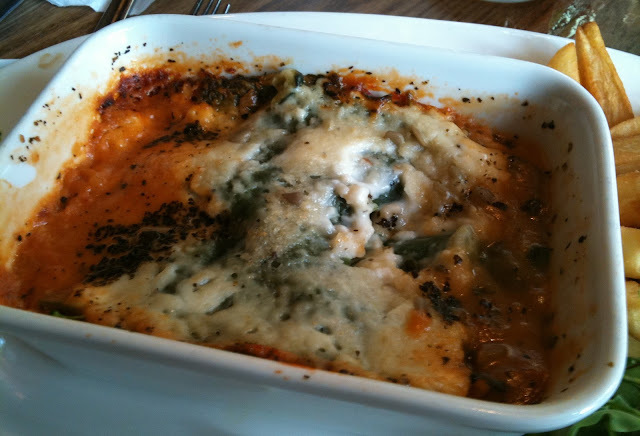 There were two vegetarian mains to choose from – Mozzarella and Pesto burger (again – Pesto is not strictly vegetarian) and the Feta and Courgette Lasagne, as well as a special which was a vegetarian pasta. 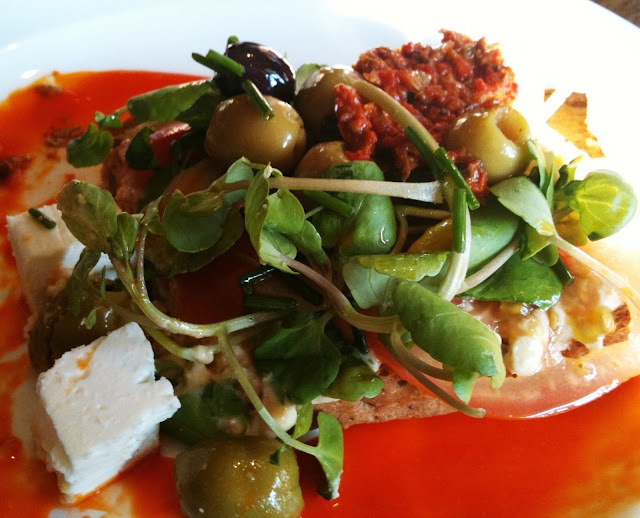 “Toasted Malted Bloomer, topped with Houmous, tomato, marinated olives, feta, and red pepper tapenade, finished with baby watercress and red pepper coulis”. The starters arrived about 10-15 minutes after ordering which was good considering the size of the group. The Summer Bruschetta was served cold and looked appealing and appetizing, although nothing like the picture displayed on their website. The Bruschetta was served on the red pepper coulis. The flavours merged well together and complimented each other. The rich red pepper tapenade added to the flavor of the houmous, olives and feta. The watercress absorbed the flavours well and provided a crunchy texture compared to the smoothness of the houmous, coulis and tapenade. The Feta crumbled well upon eating and the olives were delicious. My only slight criticism would be that I felt that cherry tomatoes would have merged better with the flavour of the dish than Salad tomatoes, which did not mix well with the other flavours. After the starters were cleared, main courses arrived about fifteen minutes later. Unfortunately, the Feta and courgette lasagne did not live up to the expectations which my starter had set. It was apparent that the lasagne had been cooked in the microwave and was not freshly made - as is the case with most vegetarian pub fare. It was served with chips and the rocket salad. The rocket salad seemed more like a rocket garnish with a couple of cherry tomatoes. For a rocket salad, I would be expecting a larger amount of rocket with a salad dressing of some description – perhaps balsamic vinegar or similar which would have complimented the rocket well. There is not much I can say to describe the lasagne other than it tasted like pure salt and pepper in a bowl. Although the temperature was satisfactory, the lasagne was overcooked and I was not able to pick out any of the courgette or feta flavours, or the pasta, it just all tasted like a rather unpleasant mush. The dessert I chose was strawberry and clotted cream ice cream, which was a refreshing finish to the meal. Altogether, the starter and dessert were pleasant, but my main did not live up to the description on the menu. Although the ambience and atmosphere of the restaurant were pleasing enough, the waitress service was not forthcoming and mistakes were made with drinks and desserts. Also, we asked for a birthday cake to be bought out which did not arrive until about twenty minutes after the dessert and by the time the bill arrived ten minutes later, we had already put the children in the car as we couldn’t wait any longer. This restaurant may be worth a visit at lunchtimes, as they have reasonable priced sandwiches and light meals including a good vegetarian range and the garden is lovely on a sunny day. They also offer a £4.99 lunchtime deal served until 5pm Monday to Saturday which includes the Mozzarella and Pesto burger and a week day offer served Monday to Thursday – 1 course for £9.99 or 3 courses for £11.99 including the mozzarella burger and the summer bruschetta. However, I would not recommend a visit over the weekend, as the menu is massively overpriced for the quality of the cuisine presented and the drinks are also substantially pricey compared to other local restaurants. The mediocre service and food led to a bad experience, and the extortionate prices left an unwelcome hole in the pocket.